Across from Olympia Farmers Market you can still find delicious, unique cupcakes. The storefront once read Sweet Charley B’s, but there are changes coming to this sweet spot in the New Year. “When I set out to open Sweet Charley B’s I had a vision in my head,” states former shop owner, Amanda Beers through the business’ Facebook page. “On the very first day the shop opened, that idea was blown right out of the water along with any other notion I ever had about running my own business.” Part of that vision was creating a business that honored Beers’ daughter, Charley. “The memory and name of my little Charley were being supported far beyond what I ever dreamed,” explains Beers. Sweet Charley B’s was well known in the community during their 18-month run. They focused on creating delicious cupcakes to please every sweet tooth. Their cupcakes were so pleasing to community member’s taste buds that they were frequently sold out before the posted closing time. However, Beers realized that the sacrifice of running her own business was taking a toll on her family life. She closed the doors of the beloved Sweet Charley B’s for the final time on December 21, 2013. Do not fret ThurstonTalk Readers. As we are saddened to see a wonderful business go, Beers is passing the spatula on to Rachel Young of Miss Moffet’s Mystical Cupcakes! “She is a talented, passionate, creative and wonderful person. You will love her,” says Beers. 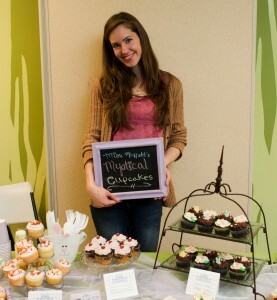 Young has been selling her confectionary creations out of Paprika Café and has even been featured on The Food Network’s Cupcake Wars as a contestant. “She will fill our shoes more than adequately,” adds Beers. “We are grateful beyond measure for this opportunity to continue the legacy of fresh-baked cupcakes in Thurston County,” exclaims Young who has been dreaming of her own storefront since discovering her passion for baking. 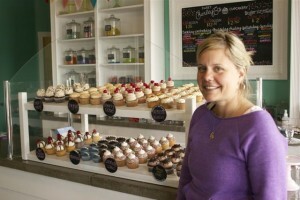 Rachel Young, owner of Mystical Cupcakes, opens her storefront on January 2, 2014. Inspired by her great-grandmother, Rachel Moffett, Young began baking one-of-a-kind cupcakes. “Miss Moffett’s Mystical Cupcakes strives to embody the comforting, homespun and delicious baking of a grandmother, unparalleled and uncompromising in freshness, quality, and overall yumminess,” describes Young who currently bakes alongside her mother. The family team is always experimenting with new flavors and recipes in an attempt to create the perfect cupcake. This experimentation has led to recognition throughout the region including an opportunity to compete in a mother-daughter edition of the wildly popular Food Network show, Cupcake Wars. Many of these flavors created in their test kitchen will be available on the Mystical Cupcakes menu. 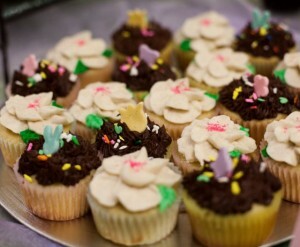 Miss Moffet’s will offer also offer gluten-free, dairy-free and sugar-free cupcakes, as well as cake pops. With flavors like triple chocolate, white chocolate raspberry, toasted coconut rum, and orange dreamsicle there are plenty of delicious options for every pallet. Opening day, January 2, will even feature a tiramisu cupcake! The sweet smell of Young’s cupcakes will waft from the Market Street location starting January 2, 2014. Find Miss Moffett’s Mystical Cupcakes on Facebook. For an additional story about Rachel Young’s experience on Cupcake Wars, click here.